Examples, solutions, videos, worksheets, songs, games, and activities to help Grade 3 students understand fractions. 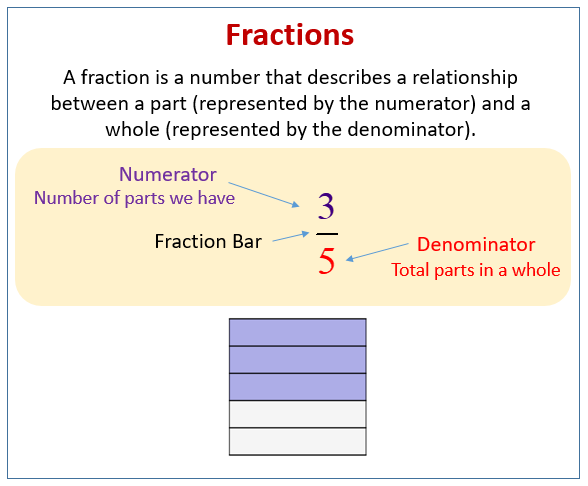 A fraction is a number that describes a relationship between a part (represented by the numerator) and a whole (represented by the denominator). Although you see two numbers, you have to think of one idea, the relationship. A fraction can be used to name a part of a whole. 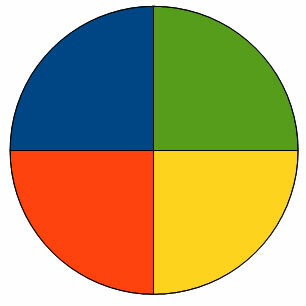 For example, the following circle is divided into four equal parts: blue, green, yellow and red. Each part, or color, of the circle represents 1/4 (one-fourth) of the whole circle. 4/4 or 1 represents the whole circle. You use numerators and denominators to name fractions. The numerator (top number) of the fraction tells the number of parts being considered. The denominator (bottom number) of the fraction tells the number of parts in a whole. The following diagram shows an example of a fraction indicating the numerator, denominator, and fraction bar. 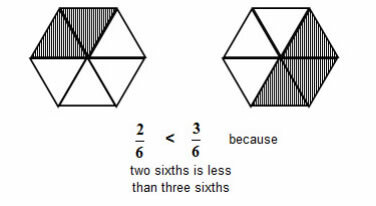 Scroll down the page for more examples and solutions of fractions. Fractions are equal size parts of a whole. Learn how to represent fractions in different ways by dividing the same whole into equal parts. Learn how to write and name a fraction by using numbers called the numerator or top number and denominator or bottom number. Learn that the larger the denominator, the smaller the fractional parts by using models and looking at real world examples. Fractions - they're parts of a whole. Sing about halves, thirds, quarters, numerators and denominators. If two fractions have the same denominator, the fraction with the greater numerator represents the larger piece of the whole. If the denominators of two fractions from the same whole are the same, then the parts are the same. We can use the symbols for greater than and less than (< and >) when comparing fractions with the same denominator. If John ate 2/6 of the pizza and Gina ate 3/6 of the pizza, who ate the most pizza? How to compare fractions with like denominators?